October 14, 2006–Full Impact Pro: Steve Madison & Chasyn Rance defeated Erick Stevens & Sal Rinauro..
November 11, 2006–Full Impact Pro: Sal Rinauro defeated Erick Stevens | Team Strong defeated Team Dragon..
~~~Team Strong = Roderick Strong (FIP Champion) & The Briscoe Brothers & Erick Stevens & Pelle Primeau..
~~~Team Dragon = American Dragon & Davey Richards & Steve Madison & Shane Hagadorn & SHINGO..
December 15, 2006–Full Impact Pro: Austin Aries defeated Erick Stevens..
December 16, 2006–Full Impact Pro: Erick Stevens defeated American Dragon. January 5, 2007–IWA Mid South: Erick Stevens defeated Arik Cannon..
January 14, 2007–AWA World 1 South: Erick Stevens defeated Steve Madison..
January 18, 2007–AWF: Kenny King defeated Erick Stevens in a 2/3 Falls match to retain the AWF Florida title..
January 20, 2007–AWA World 1 South: The Heartbreak Express defeated Jon Davis & Erick Stevens..
February 3, 2007–Full Impact Pro: Erick Stevens defeated Gran Akuma in a Florida Heritage Title Tournament Qualifier..
~~~IN THE MAIN EVENT: Colt Cabana & Erick Stevens defeated YRR (Larry Sweeney & Claudio Castagnoli)..
February 17, 2007–AWA World 1 South: Vordell Walker defeated Erick Stevens..
March 6, 2007–American Combat Wrestling: Ray Beez defeated Erick Stevens..
~~~~~Erick Stevens defeated Delirious w/Dave Prazak in a Semi-Final match to advance to the Finals of the Tournament..
~~~~~~Erick Stevens defeated Roderick Strong to win the Tournament and capture the brand new Florida Heritage title! March 30, 2007 – Ring of Honor: Erick Stevens defeated Alex “Sugarfoot” Payne (ROH Student)..
March 31, 2007 – Ring of Honor: Erick Stevens defeated Mitch Franklin in a 10-minute Do of Die match..
April 13, 2007 – Ring of Honor: Erick Stevens defeated Jason Blade and Eddie Edwards and El Generico in a 4-Corner Survival..
~~~LATER THAT NIGHT: Team No Remorse (captain Roderick Strong) defeated The Resilience (captain Austin Aries)..
~~~~~~~~~Roderick Strong & Davey Richards & Rocky Romero defeated Austin Aries & Matt Cross & Erick Stevens..
April 14, 2007 – ROH: Kevin Steen & El Generico defeated Jay Briscoe & Erick Stevens when El Generico pinned MARK Briscoe..
April 20, 2007–Full Impact Pro: Erick Stevens defeated Claudio Castagnoli w/So Cal Val to retain the FIP Florida Heritage title..
April 21, 2007–Full Impact Pro: Erick Stevens defeated Nigel McGuinness w/Dave Prazak to retain the FIP Florida Heritage title. April 27, 2007 – Ring of Honor: Rocky Romero defeated Jack Evans and Erick Stevens and Delirious in a 4-Corner Survival..
April 28, 2007 – Ring of Honor: “The Fallen Angel” Christopher Daniels vs. Erick Stevens ended in a time limit draw..
April 29, 2007–Full Impact Pro: Erick Stevens defeated Chasyn Rance to retain the FIP Florida Heritage title..
May 12, 2007 – Ring of Honor: Davey Richards (No Remorse Corps) defeated Erick Stevens (The Resilience)..
May 25, 2007–Full Impact Pro: Erick Stevens defeated Delirious w/Dave Prazak to retain the FIP Florida Heritage title..
May 26, 2007–Full Impact Pro: Erick Stevens defeated Danny Daniels to retain the FIP Florida Heritage..
June 29, 2007–Full Impact Pro: Erick Stevens defeated Damien Wayne to retain the FIP Florida Heritage title..
June 30, 2007–Full Impact Pro: Erick Stevens defeated Jigsaw to retain the FIP Florida Heritage title..
July 27, 2007 – Ring of Honor: Chris Hero defeated Erick Stevens in the 1st Round of the “Race to the Top” Tournament..
July 28, 2007 – ROH: Erick Stevens defeated B.J. Whitmer and Kevin Steen and Matt Cross and Jigsaw and Hallowicked (6-WAY)..
August 18, 2007–Full Impact Pro: Erick Stevens defeated Davey Richards to retain the FIP Florida Heritage title..
August 24, 2007 – Ring of Honor: Austin Aries & Erick Stevens & Matt Cross beat Davey Richards & Jason Blade & Eddie Edwards..
August 25, 2007 – Ring of Honor: The Resilience (Matt Cross & Erick Stevens) defeated Jigsaw & Mike Quackenbush..
~~~EARNED A SHOT AT THE ROH WORLD TITLE: Takeshi Morishima defeated Erick Stevens to retain the ROH World title..
September 15, 2007 – ROH: Roderick Strong (No Remorse Corps) defeated Erick Stevens (The Resilience) with the Gibson Driver..
September 28, 2007–Full Impact Pro: Erick Stevens defeated Jack Evans to retain the FIP Florida Heritage title..
September 29, 2007–FIP: Erick Stevens defeated Necro Butcher in an Anything Goes Match to retain the FIP Florida Heritage title. October 5, 2007 – Ring of Honor: HANGMAN 3 (Brent Albright & Adam Pearce) defeated Erick Stevens & Matt Cross..
October 6, 2007 – ROH: No Remorse Corps (Davey Richards & Rocky Romero) beat The Resilience (Matt Cross & Erick Stevens)..
October 27, 2007–Division-1 Pro Wrestling: Scott Commodity defeated Erick Stevens..
November 30, 2007 – Ring of Honor: Davey Richards defeated Human Tornado (submitted) and Erick Stevens in a Triple Threat..
December 29, 2007 – Ring of Honor: Davey Richards defeated Erick Stevens with Daniel Puder spotted in the audience..
~~~Erick Stevens challenged WWE Tough Enough Winner Daniel Puder (who was sitting in the crowd)..
January 11, 2008 – Ring of Honor: Erick Stevens defeated Austin Aries to retain the FIP World Heavyweight title..
January 12, 2008 – Ring of Honor: Erick Stevens defeated “American Dragon” Bryan Danielson to retain the FIP World title. January 19, 2008–Pro Wrestling Riot: Erick Stevens defeated Ray Beez in an Anything Goes Match to retain the FIP World Title..
January 25, 2008 – Ring of Honor: Erick Stevens defeated Davey Richards and Austin Aries in a 3-WAY to retain the FIP World title..
January 26, 2008 – Ring of Honor: Austin Aries & American Dragon defeated Erick Stevens & Jay Briscoe (UE Qualifying match)..
March 14, 2008 – Ring of Honor: Claudio Castagnoli & Erick Stevens defeated Nigel McGuiness (ROH Champion) & B.J. 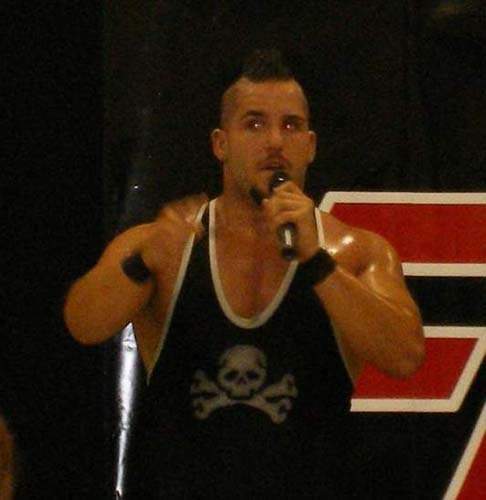 Whitmer..
March 15, 2008 – Ring of Honor: Tyler Black (of The Age of the Fall) defeated Erick Stevens..
March 22, 2008–Full Impact Pro: Erick Stevens defeated Shane Hagadorn..
~~~After the match; Roderick Strong knocked Erick Stevens out with the FIP championship to start the show..
~~~~~~NRC members Davey Richards & Rocky Romero showed up to help Strong shave the Mo-hawk right off of Stevens’ head! May 9, 2008 – Ring of Honor: Austin Aries defeated Erick Stevens (Aries called out Jimmy Jacobs but Stevens answered)..
May 30, 2008–Full Impact Pro: Erick Stevens defeated Davey Richards (who was defending his “friend” Roderick Strong)..
May 31, 2008–Full Impact Pro: Erick Stevens defeated Damien Wayne and Dingo and Jon David in a 4-WAY..
~~~Scotty Too Hotty defeated Davey Richards with a W.O.R.M. after Erick Stevens ran out and attacked Richards..
June 21, 2008–APWF: Roderick Strong defeated Erick Stevens..
June 27, 2008 – Ring of Honor: Erick Stevens defeated “American Dragon” Bryan Danielson and got a standing ovation..
June 28, 2008 – Ring of Honor: Erick Stevens defeated Jay Briscoe..
July 25, 2008 – Ring of Honor (Debut in Toronto): Erick Stevens vs. Go Shiozaki w/Sweet & Sour Inc. ended in a 15:00 draw..
~~~Canadian legend Lance Storm saved Erick Stevens from a beat-down and put Sweet & Sour’s Chris Hero in the Mapleleaf! August 15, 2008 – Ring of Honor: Erick Stevens defeated Claudio Castagnoli by DQ to retain the FIP World Heavyweight title..
August 16, 2008 – Ring of Honor: Erick Stevens defeated Chris Hero w/Larry Sweeney to retain the FIP World Heavyweight title..
August 23, 2008–Full Impact Pro: Go Shiozaki (w/HBE) defeated Erick Stevens to win the FIP World Heavyweight title..
August 24, 2008–GEAR Wrestling: Erick Stevens defeated Chasyn Rance..
September 20, 2008 – Ring of Honor: Erick Stevens defeated “Addicted to Love” Rhett Titus..
~~~After the match, Erick Stevens was beat up by Sweet & Sour Inc. after he declined Larry Sweeney’s offer to join the group..
October 11, 2008–Full Impact Pro: Tyler Black from the Age of the Fall defeated Erick Stevens..
November 7, 2008 – Ring of Honor: Erick Stevens defeated “Die Hard” Eddie Edwards w/Sweet & Sour Inc..
December 26, 2008 – Ring of Honor: Chris Hero defeated Erick Stevens..
February 8, 2009–FIP Eddie Graham Tournament: Davey Richards defeated Erick Stevens in a 1st Round match..
February 27, 2009 – Ring of Honor: Kenny King & Rhett Titus defeated Erick Stevens & Bobby Dempsey..
February 28, 2009 – ROH HDTV Taping (Episode #3): Erick Stevens defeated Sterling James Keenan..
March 1, 2009 – ROH HDTV Tapings: Erick Stevens defeated Leslie Butterscotch in a dark match..
March 20, 2009 – Ring of Honor: Rhett Titus & Kenny King defeated Erick Stevens & Matt Cross..
April 3, 2009 – Ring of Honor: Erick Stevens defeated Rhett Titus..
April 4, 2009 – Ring of Honor: Jerry Lynn defeated American Dragon and Erick Stevens and D-Lo Brown to retain the ROH title..
April 9, 2009–ROH HDTV Taping (Episode #7): Erick Stevens defeated Sal Rinauro..
April 10, 2009–ROH HDTV Taping (Episode #11): Erick Stevens defeated Sami Callihan..
May 29, 2009–ROH HDTV Taping (Episode #14): Kenny Omega defeated Kenny King (Erick Stevens made the post match save)..
May 30, 2009–ROH HDTV (Ep. #16): Jerry Lynn & Erick Stevens & Kenny Omega beat Austin Aries & Rhett Titus & Kenny King..
June 27, 2009 – Ring of Honor: Erick Stevens defeated Rasche Brown..
August 14, 2009–ROH HDTV Taping: Erick Stevens defeated Brandon Day..
~~~Participants: The Young Bucks (Nick & Matt Jackson), The American Wolves (Davey Richards & Eddie Edwards)..
October 3, 2009–Full Impact Pro: The British Lions defeated Erick Stevens & Roderick Strong in a Cage to win the Tag Team titles..
November 5, 2009–ROH TV Taping: Erik Stevens defeated Robbie Marcel..
~~~LATER THAT NIGHT: Necro Butcher defeated Joey Ryan w/The Embassy by DQ (Erick Stevens made the save!).. November 6, 2009–ROH TV Taping: Joey Ryan w/Prince Nana & The Embassy defeated Necro Butcher in a no disqualification match..
November 6, 2009–ROH TV Taping: Erik Stevens defeated Harlem Bravado of the Bravado Brothers..
November 20, 2009–Full Impact Pro: Erick Stevens defeated Kyle O’Reilly in a PWR pre-show match. November 21, 2009–Full Impact Pro: PWR Heavyweight champion Bruce Santee defeated Erick Stevens by disqualification..
December 5, 2009–Ring of Honor: Necro Butcher defeated Erick Stevens by disqualification after Stevens whacked Necro with a chair..
December 19, 2009–Ring of Honor: The Embassy (Erick Stevens & Bison Smith) beat Delirious & Pelle Primeau & Bobby Dempsey..
January 8, 2010–ROH: Necro Butcher & Eddie Kingston defeated Joey Ryan & Erick Stevens w/Prince Nana by intentional count-out..
January 29, 2010–Ring of Honor: Necro Butcher defeated Erick Stevens in an Anything Goes match..
~~~Joey Ryan came out and accidently hit Stevens with a stop sign (After the match, Necro was attacked by The Embassy! February 5, 2010–ROH TV tapings: Erick Stevens defeated Pelle Primeau (Necro Butcher made a post-match save!).. February 13, 2010–Ring of Honor: Necro Butcher & Eddie Kingston w/Gypsy Joe defeated Joey Ryan & Erick Stevens..
April 23, 2010–Ring of Honor: Necro Butcher & Skullcrusher Rasche Brown defeated Erick Stevens & Shawn Daivari..
May 8, 2010–Ring of Honor: Erick Stevens defeated Grizzly Redwood..
~~~Rasche Brown made the post match save, but was beaten up by the new “crown jewel of the Embassy” Necro Butcher! ~~~~~~~~~~~~~~~~the Dark City Fight Club made the save! – but later Erick Stevens & Necro Butcher attacked the Fight Club! July 16, 2010–ROH TV Tapings: Necro Butcher & Erick Stevens defeated Robbie Wolf & Damien Dragon in a pre-show match..
July 16, 2010–ROH TV Tapings: El Generico defeated Erick Stevens by disqualification after interference by Steen & Corino..
July 17, 2010–ROH TV Tapings: The Embassy defeated Rasche Brown & Kory Chavis & Jon Davis & Grizzly Redwood..
~~~The Embassy = Necro Butcher & Erick Stevens & Shawn Daivari & Ernesto Osirus w/Prince Nana..
July 23, 2010–Ring of Honor: Grizzley Redwood defeated Erick Stevens by disqualification after interference by Necro Butcher..
July 24, 2010–Ring of Honor: The Embassy (Erick Stevens & Necro Butcher) defeated Rasche Brown & Grizzly Redwood..
July 31, 2010–Full Impact Pro: Roderick Strong vs. Erick Stevens in the Cage of Pain was declared a double countdown..
August 28, 2010–ROH Tag Wars: El Generico defeated Erick Stevens. September 10, 2010–ROH Fade to Black: ROH world TV champion Eddie Edwards defeated Erick Stevens to retain the title. September 11, 2010–ROH Glory By Honor: Erick Stevens and Necro Butcher defeated Balls Mahoney and Grizzly Redwood. September 20, 2010–ROH TV (Taped): Erick Stevens and Necro Butcher defeated Jon Davis and Kory Chavis. October 25, 2010–ROH TV (Taped): Erick Stevens and Necro Butcher defeated Grizzly Redwood and Andy Ridge. November 22, 2010–ROH TV (Taped): Colt Cabana defeated Erick Stevens to become #1 contender for the ROH TV title. December 6, 2010–ROH TV (Taped): Davey Richards defeated Erick Stevens.